Applied Scholastics uses methods that have proven to be effective at all levels of educational development. These methods, known as Study Technology, were developed by author and educator L. Ron Hubbard. Study Technology enables students to understand and apply what they have studied and to retain this ability throughout their lives. 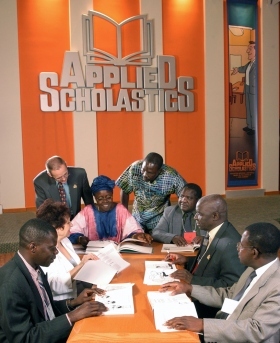 Since 1972, Applied Scholastics has trained more than 100,000 educators in Study Technology. They have in turn educated upwards of 28 million students using this technology. Today, the Applied Scholastics network comprises more than 760 schools, literacy centers and tutoring groups in 74 nations across six continents. In essence, our training programs and continuing education courses provide teachers and educators with the skills and strategies they need to teach students to overcome study barriers and so learn how to learn. To receive that training, teachers can come to the Applied Scholastics campus in St. Louis, Missouri, or a national or regional training center, or Applied Scholastics can establish local training academies and on-site training in your area. Services available at Applied Scholastics International range from workshops, conventions and courses on basics to advanced teaching strategies and methodologies. Some of these courses are available with continuing education credits or postgraduate credits. Training at the campus provides professional educators with commanding tools, interactive learning strategies and teaching techniques with which to create and provide an optimum knowledge base and learning environment. Here, educators will master the applications that allow students to become more accountable, self-directed and self-advocating.